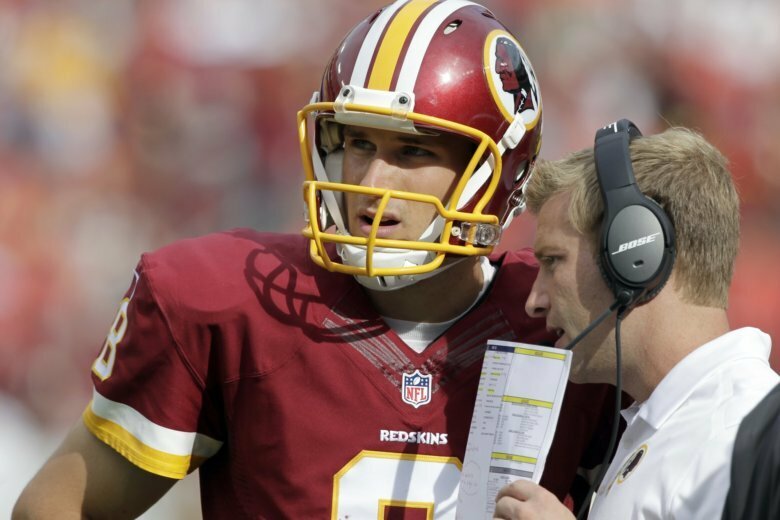 After they collaborated on two tremendously productive seasons, the partnership led to big things for both men: McVay became the NFL’s youngest head coach in Los Angeles, and Cousins got an $84 million contract in Minnesota. Indeed, they’re getting back together Thursday night in a compelling early season NFC showdown between McVay’s Rams (3-0) and Cousins’ Vikings (1-1-1). And both say they wouldn’t be there under the Coliseum lights without the other. “I feel fortunate to have worked with Kirk,” McVay said. “Sometimes you hear people talk about not having the strongest arm or whatever, (but) I’m not sure what film they’re watching,” McVay added. Their meeting will be an interesting barometer for both teams’ early season fortunes. The Rams have been largely outstanding during their unbeaten start to a season that has picked up right where McVay’s first team left off. But coach Mike Zimmer’s Vikings defense gave perhaps the most impressive performance of last season against the high-octane Rams, who managed only one early touchdown from Todd Gurley in a 24-7 loss at Minnesota. The Rams realize Thursday afternoon isn’t an ideal time to brave LA traffic for a football game at a stadium undergoing renovation that has severely curtailed its parking and tailgating. So they’re trying to make this important NFC game into a civic duty: McVay sent out a funny “memo” through newspapers and social media to all employers in Los Angeles, urging them to allow their employees to leave work early so they can head downtown for the 5:20 p.m. local start time — which he says is the “typical bedtime” of his 71-year-old defensive coordinator, Wade Phillips. They also got Vanessa Hudgens to sing the national anthem, while Compton rapper YG will perform in the second quarter. The Vikings flew to Los Angeles on Tuesday evening, hoping to better acclimate to the two-time-zone change. The Vikings are 1-5 in Thursday night road games, winning only at Dallas in 1978. Traveling cross-country to play one of the NFL’s best teams with three days of rest is a daunting task. The Vikings will play without defensive end Everson Griffen, a captain and three-time Pro Bowl pick. The former USC star won’t make his Coliseum return while he is sidelined indefinitely for treatment of mental illness following a pattern of erratic and threatening behavior. With players, coaches and staff concerned about Griffen’s well-being, the show must go on. Stephen Weatherly had his first career sack against the Bills while starting in place of Griffen. The Rams have bigger problems than a late start time: Their star-studded defense is suddenly short-handed after former Pro Bowl cornerbacks Aqib Talib and Marcus Peters both incurred injuries in last week’s win over the Chargers. Talib needs ankle surgery and will be out for at least eight weeks. Peters’ calf injury isn’t so serious, but still might keep him out. The Rams are likely to go against Cousins with backup cornerbacks including Sam Shields, Troy Hill and Nickell Robey-Coleman. After ranking seventh in the NFL last season in yards rushing, the Vikings are next-to-last with just 66 yards per game, although they’ve been throwing excessively with two late deficits in their first three games. There still hasn’t been much room for Dalvin Cook or Latavius Murray to run, and going against the Rams’ stout defensive line won’t help. Pat Elflein will return to the starting lineup at center, his rehab from offseason surgeries finally complete.